At Artistic Strategies Academy, we recognise that every child is different and would have different learning needs. Therefore, after conducting a diagnostic test for our students, we are able to ascertain the strengths and areas of improvement. We then customise our teaching methods and at times, our teaching materials to suit the needs of the students. We have the luxury of doing so because our class size is small (a maximum of 6 students in a classroom) and our teacher-student ratio is low (1 teacher to a maximum of four students). We have a diverse range of students who come with different gifts and talents. Some are more creative and can generate original ideas for their written pieces. Thus, we give them appropriate avenues to express such creativity and we guide them in choosing the best ideas to include in their writing. Others come with a good range of vocabulary and we teach them how to use such words and phrases appropriately. Similarly, the children also have different areas of improvement. Some of them are unclear about the proper use of subject-verb agreement or tenses. In such cases, we provide the students with extra practices to instil in them the habits of using correct grammar. We are also flexible in providing multiple ways in which children can complete activities. For example, we found out that unscrambling words really help some children remember the spelling of words. Additionally, some students prefer to sketch a setting (a time and place in the story) before writing about it while others prefer to create a model of it using clay and cardboard. 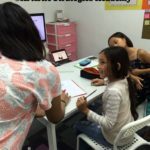 We are able to provide both methods as the most important thing is to ensure that the child is engaged and motivated to learn. According to the renowned psychologist, Vygotsky, children need to be sufficiently challenged. He introduced the concept of the zone of proximal development, which encompasses the activities that children can do with guidance. 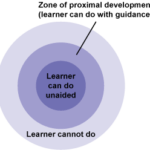 In our lessons, the teachers identify this zone for every student to ensure that students are given enough guidance but at the same time, do not feel bored doing tasks that are too easy for them. For example, at the end of every chapter in our second workbook, there is an extension activity (a more challenging activity that extends their learning) that children can attempt to be challenged and pushed out of their comfort zones. Customised or personalised learning also makes it easy to reinforce a student's learning. Before a student begins the main activities of the lesson, they will first revise the previous week's vocabulary words or any other work that the teacher deems fit to revise with the student. Additionally, throughout the lesson, the student will be prompted and encouraged to use what he or she has learned previously. This solidifies their learning and ensures that any new knowledge or skills that they gain every lesson will not be forgotten. “Understanding Language and Learning.” OpenLearn, The Open University, www.open.edu/openlearn/languages/understanding-language-and-learning/content-section-6. Cherry, Kendra. “What Was Lev Vygotsky's Influence on Psychology?” Verywell Mind, Verywellmind, www.verywellmind.com/lev-vygotsky-biography-2795533. 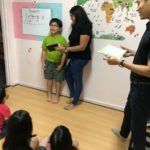 This entry was tagged composition, customised writing curriculum, education, enrichment classes, paper 1, primary one, psle, singapore parents, writing. Bookmark the permalink.